Powers/Abilities: The Spider Queen wore two bracelet-like devices which emitted a "web fluid" that she could use to bind and restrain others and to swing from rooftops or hang outside windows; she was also an accomplished acrobat and hand-to-hand combatant, and her ability to reproduce her husband's web fluid implies that she was an above-average chemist. (Eagle#2/6 / Invaders II#3 (fb)) - In 1939 (see Comments), Shannon Kane was working with her husband, "brilliant young government chemist" Dr. Harry Kane, on a special assignment involving new steel alloys. Two Russian agents (Rudy and an unnamed second man) broke into Dr. Kane's lab, killing him before Shannon's eyes and stealing his notes. (Eagle#2/6 (fb)/Invaders II#1 (fb) - BTS) - While sorting through her husband's records some months later, Shannon discovered a formula for a "spider-web fluid" which her husband had developed but had supposedly never found practical applications for. Reproducing the web fluid, Shannon took on the crimefighting identity of the Spider Queen, in part motivated by admiration of Captain America, who had debuted in late 1940. (Eagle#2/6) - In 1941, already active as a crimefighter for months, the Spider Queen foiled an attempted bank robbery, strangling one of the fleeing criminals, Curly, with her web line. Plainclothesman Mike O'Bell took an interest in her activities, and the Spider Queen, hoping to gain inside police information, sought him out as Shannon Kane to win his friendship. Learning that a recent series of robberies had been undertaken under the leadership of O'Bell's corrupt chief, the Spider Queen exposed the criminal activities, allowing O'Bell to take credit for the capture. (Eagle#3/5) - With the assistance of O'Bell, the Spider Queen foiled an attempt by racketeers to force owners of small stores to sign over their businesses. (Eagle#4/5) - The Spider Queen worked with O'Bell to capture the escaped murderer known as the Noose. (Avengers 1959#5 (fb) - BTS) - Affairs with Krupp and Speer gave Spider Queen access to experimental technology. (post-Eagle#4/5 / pre-Invaders II#1) - At some point following the US's entry into World War II on the side of the Allies, the Spider Queen was approached by Doctor Death to join the team of Axis operatives known as Battle-Axis; motivated by a hatred of the Soviet Union due to her husband's murder, she agreed to work against the Allied cause. It is not known if Mike O'Bell knew of this decision nor what his reaction was if he did. The Spider Queen remained out of sight for months as the team prepared to undertake "Project Mojave," an elaborate scheme whereby a device called an oscillotron would cause a severe earthquake on the west coast, destroying war industry plants, releasing poison gas from underground storage, and theoretically causing the US to withdraw from the war in order to deal with the homefront crisis; her absence from the public eye was noted by the member of the Liberty Legion called the Thin Man, who was keeping track of super-hero activities. (Invaders II#1) - On June 22, 1942, at New York Harbor, after the Invaders attacked a Nazi u-boat, Battle-Axis counterattacked, with the Spider Queen fighting Captain America during the struggle before Battle-Axis departed. Battle-Axis next abducted the Whizzer, although Miss America evaded capture. (Invaders II#2) - The members of Battle-Axis traveled to Hollywood, CA via the airship of the Nazi Skyshark, and the Spider Queen and others stood by as Volton electrocuted two police officers who witnessed their arrival. The Spider Queen accompanied the Human Meteor and Strongman to UCLA, where, after questioning the oscillatron's creator, Professor Carson, they killed both Carson and private detective Dan Hurley before clashing with Captain America, Miss America, and the Silver Scorpion, then subsequently fled the scene. (Invaders II#3) - In Battle-Axis's secret base beneath the Mojave Desert, Doctor Death and the other members of Battle-Axis elaborated on their background and plans to a captive Torch and Whizzer. When the Invaders invaded the base, they were fought to a standstill by Battle-Axis (with the Spider Queen fighting the Silver Scorpion), until Doctor Death, using the "dimension smasher" created by Professor Enoch Mason (a scientist forced into his employ), summoned the extradimensional Aarkus (a.k.a. the Vision) and forced him to defeat the Invaders. (Invaders II#4) - When Doctor Death explained his plans to the captive Invaders, Spider Queen expressed surprise upon hearing that poison gas would be released upon western California; when the Invaders escaped and attacked Battle-Axis, she was drawn into battle with Miss America, but the fight ended when the Sub-Mariner destroyed the oscillotron. Spider Queen and the other members of Battle-Axis (except for Doctor Death, who was left for dead) surrendered to the Invaders and were presumably taken into custody. The Spider Queen's subsequent wartime activities and her fate following the war are unrevealed (see Comments). (Avengers 1959#5 (fb) - BTS) - Spider Queen joined Geoffrey Sydenham's secret US intelligence organization Icon around 1959. (Avengers 1959#5) - Spider Queen joined Sydenham in Washington DC alongside Baron Blood, Brain Drain, Geist and some Hollow Men. They fought the Avengers, who attempted to take down Icon. Blonde Phantom knocked her out during the fight. Comments: Created by Elsa Lesau (believed to be a pseudonym for Louis and Arturo Cazeneuve) & Pierce Rice (artist) for Fox Features Syndicate; adapted for the Marvel Universe by Roy Thomas, Dave Hoover, and Brian Garvey. 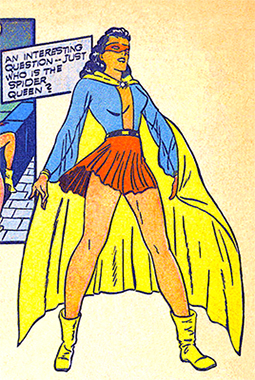 Roy Thomas had originally intended Battle-Axis to consist of minor wartime heroes of Timely Comics (predecessor of Marvel), but Mark Gruenwald nixed that idea, and super-heroes from now-defunct wartime publishers were used instead; the Spider Queen's position in Battle-Axis was probably originally intended for the Silver Scorpion. In Invaders II#3, while recounting her origin to the Human Torch, the Spider Queen claimed that her real name was Sharon Kane, that her husband was killed on June 20, 1941, and that her husband's web fluid was developed as a weapon to be turned over to the government, all allegations which contradict her original golden age origin; it may be that she deliberately chose to provide the Torch with false details to confuse any subsequent investigation. It should be remembered that all the non-Marvel adventures listed in the history above, along with details of affiliations, enemies and relations, are unconfirmed. They happened to the original Golden Age character from Fox Features Syndicate. Similar adventures and details are ASSumed to apply to the Marvel Universe version, but these are not confirmed. 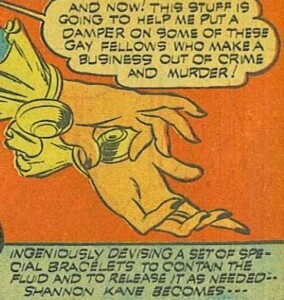 This might also explain the discrepancies between her Golden Age appearances and the story she told the Torch. The Spider Queen was the only member of Battle-Axis whose costume colors in her original appearances were unknown; it may be that her golden age adventures depicted her in colors other than red and yellow (which give her an unnecessary resemblance to Spider-Woman (Jessica Drew)). Here's Spider Queen in her first appearance. On the editorial page of Invaders II#4, Roy Thomas wrote that they only had black-and-white copies of her exploits, so they had to guess at her costume's coloring. 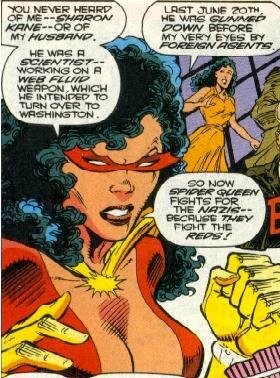 But the coloring discrepency could be explained easily enough--Maybe she remade her costume with new colors when she joined Battle Axis (Do I get a No-Prize?). The Spider Queen's costume was seen on display alongside the costumes of other wartime heroes in the mansion of Thomas Halloway, a.k.a. the Angel (the earliest known hero of Earth-616's golden age, already active as of Marvel Comics#1), in Captain America I#442; whether or not this indicates that the Spider Queen eventually abandoned the Axis cause to return to crimefighting is as yet unrevealed, although this would be consistent with the doubts she expressed about some of Battle-Axis's activities during the Invaders storyline.